"When I asked her about why she was so late, I think she snarled at me?" We all know a few folks who fall under the "late to the party" description. We tell them to meet us somewhere at 8:00, and at 8:15 they inform us that, due to an unforeseen chimpanzee emergency, they're just now leaving their underground science compound. By now, I think it's safe to assume that the rest of the Evolve cast has long since given up on Dr. Kala Kapur and any hope of her joining them on their hunting excursions. Thankfully, they'd be wrong. Starting today, Kala will meander into Hunter HQ, act like nothing's amiss, and ask if she can hop into the next session. She'll be taking on the Support role, which has been held primarily by Hank, Bucket, Cabot, and Sunny. To differentiate herself, she's decided to get into the whole "genome splicing" thing all the kids are into and combined Monster DNA with that of her own. She's also brought a teaser trailer that she'll no doubt throw onto the HQ's projector and act surprised when it starts playing. Admittedly, Kala may be a latecomer, but her abilities do seem pretty fascinating. I'd be willing to forgive just about anyone's tardiness if they managed to teleport me away from the onrushing claws of a spider-monstrosity. 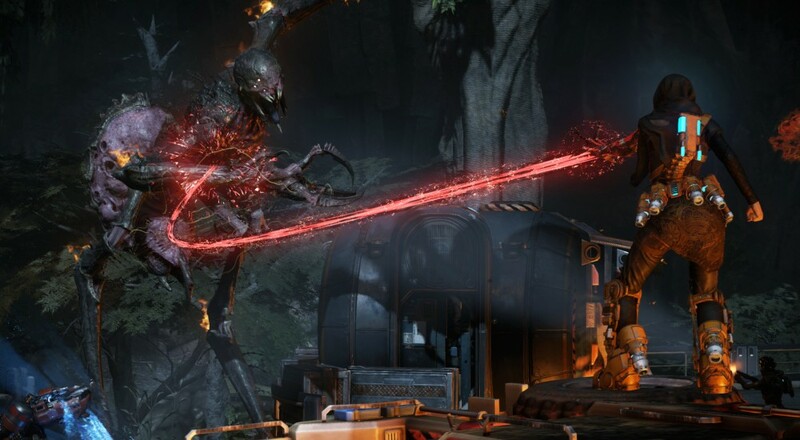 Evolve is just about to reach its first year anniversary and, with the release of Kala, has completed three DLC packs in the time since release. If you're interested in picking up the game, I'd recommend checking out our review first, then looking into Evolve: Ultimate Edition, which contains the base game, the "Monster Expansion Pack", "Hunting Season 1", and "Hunting Season 2". Oh, and I guess you should come to terms with the inevitable number of times you'll be treated like a man-sized chew toy. Help Turtle Rock Name The Fourth Evolve Monster! Page created in 0.3528 seconds.